"Really sad folk — by which I mean those cooks who haven't the first clue as to how to carefully fry an egg — now advocate the use of lashings of extra-virgin olive oil in almost every single recipe; they actually fry with it, make dreadful risotto with it, drizzle it over everything in sight, and probably even use it as bath oil. No one in their right mind would heat up an expensive slug of extra-virgin, in which to fry, say, a dreary chicken breast, but they surely do, these equally dreary people." I have, as I'm sure many of my generation have, fond memories of my mother liberally applying Squeeze Parkay to various vegetable dishes, from steamed broccoli to sautéed spinach. I remember, in particular, the smiley faces she drew on our Sunday pancakes with the bright yellow substance. As I look back, I realize that I never thought the stuff odd in the slightest. Its not-quite-liquid-not-quite-solid state never perplexed me, and I accepted it without once considering the thing it was designed to replace: butter. As I grew up and began cooking for myself, I moved away from Parkay. A distrust of processed foods and additives ended my relationship with margarine, and I moved, happily enough, to olive oil. We hear a lot about olive oil and its '"good It has the uncanny ability to make members of a small village in Italy live longer than almost anywhere else in the world. And by golly, it can taste good, too. However, olive oil became something of a kitchen crutch. I used it to cook everything, and it was perhaps the first item I bought in bulk. As it turns out, olive oil isn't just my crutch. It's everyone's. If you browse a selection of recipes from the past 10 years or so, most savory dishes involve olive oil, the exceptions being recipes that call for deep-frying or stir-frying. The only problem with this tendency is that it neglects a host of other options — options that may be more appropriate for the effects you wish to achieve. I'm not going to bash olive oil. And I certainly don't feel comfortable lambasting the people who use it exclusively, although Simon Hopkinson manages to do so more or less gracefully, in that very British way of criticizing that also makes you laugh hysterically. Drizzled over hummus or heartbreakingly ripe tomatoes, there is nothing finer than extra-virgin olive oil, and it is still the fat I cook with most often. However, I propose a second look at butter — real butter. It can be as instrumental to tasteful cooking as using the right pan or adding an appropriate amount of salt. Butter is a sensitive medium for cooking. 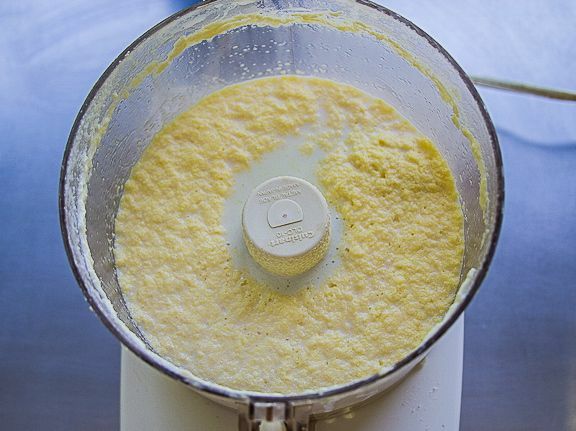 It transforms from solid to liquid fairly rapidly and with little notice, and the milk solids are prone to precipitating out of the butter and browning. If you harness this tendency, you may use it to your advantage. Brown butter is a mighty fine thing. However, this also hints at butter's limitations: It is not suited to high-heat cooking. 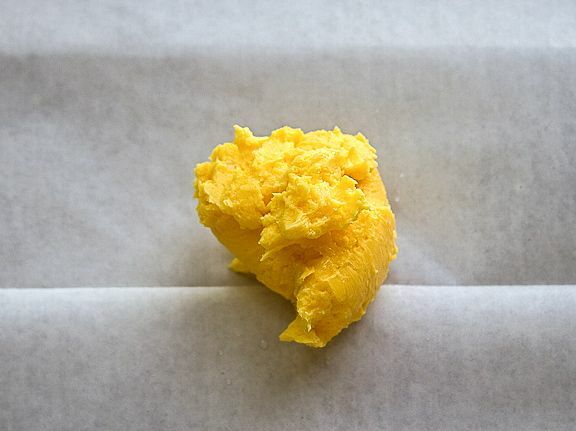 Clarified butter — butter that has been melted and its milk solids removed — can withstand higher temperatures, but it has a different flavor profile. To put it simply, butter is something of a shape-shifter, and once its properties change, so does its flavor. Bearing this in mind, butter is perhaps best appreciated in its raw form. The different fats in butter melt at different temperatures. This is why the flavor of butter lingers on the tongue in such a seductive way and why, perhaps, even the trickiest of substitutes can never quite deceive our discerning taste buds. Butter has come under scrutiny over the past several decades; thus the impetus towards margarine and vegetable-based fats. However, in recent years a backlash has been developing against these highly processed fats and in favor of real butter. I am not a scientist, nor am I a nutritionist, and so I will refrain from making sweeping statements about the healthfulness of butter versus margarine, olive oil, or any other vegetable or animal fat. However, I am a cook and a concerned consumer, and as my appreciation for food and cooking deepens, I understand more and more that sometimes butter is the single most appropriate fat for a given application — toast being one of them. While we may fetishize olive oil and the archetypal Italian cuisine that spawned it, butter, it turns out, is just as important to Italian cuisine as olive oil is. Traditionally, in northern Italy, butter was more commonplace than olive oil, owing to a vibrant dairy culture. And the French? Well, I'm guessing you already know where they stand on the subject of butter. My point is that butter is just as relevant to our cooking as olive oil, in much the same way that shallots are just as relevant as red onion, or parsley is just as relevant as cilantro. They're fundamentally different — they occupy different spheres. Excluding one in favor of the other is not necessarily wrong, but it's certainly myopic. What's more, butter, while a molecularly complex and fascinating product, is, ingredient-wise, very simple. Butter need only contain one ingredient — cream — and the process for making butter is easily understood and replicated by the average person. Of course, butter-making on a commercial scale is no doubt a somewhat more complicated affair. In my kitchen, however, I most frequently use a Mason jar with a tight-fitting lid to enact this transformation. And you might try it too. 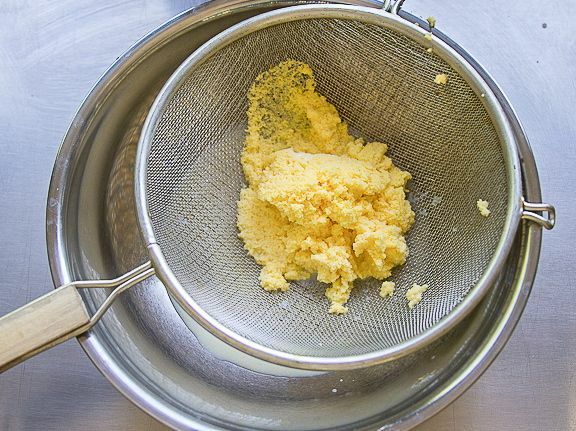 If you agitate heavy cream — whether in a jar, a food processor, an electric mixer, or a butter churn — long enough, the membranes surrounding the globules of butterfat break down, allowing the butterfat to merge into a mass. If you've ever over-whipped heavy cream, you may have inadvertently experienced this phenomenon. Of course, as with any cooking project, the better your raw materials are, the better the final product will be. Even if you bother to do this only once, I encourage you to make butter at home using the highest quality cream you can buy. If you're lucky, you have a conscientious farmer in your neighborhood who will happily sell you raw or gently pasteurized cream or whole milk. If you are able to find a local source for milk from grass-fed animals, you need to ask some questions before you buy. First off, familiarize yourself with your state's laws regarding raw dairy. Raw milk can be a wonderful thing, but if handled improperly or if taken from sickly animals, it can harbor harmful bacteria, or it may simply be of poor quality. There are many responsible and knowledgeable farmers who use good sanitation practices and who care for their animals meticulously, and ensure that they are nutritionally and physically sound. If you have any interest in raw dairy but have concerns or questions (and you should), do not hesitate to ask a raw-dairy farmer. They should be able to answer any questions you have, and they should not disregard or belittle concerns about the safety or handling of raw dairy products. If they do, find another farmer. Having said all this, raw milk may not be for you. I have been lucky enough to find a fabulous source for raw Jersey cow milk. The farmers who own the cow are very conscientious and open with the people who buy their raw milk; they notify us about how pasture conditions affect the milk, the cow's breeding schedule, and the methods they use for ensuring that the milk they deliver is impeccably fresh and clean. However, if you cannot find such an ideal situation, or if you are pregnant, nursing, have very small children, or have a compromised immune system, the risk may not be worth it. Just as there is a risk with eating raw shellfish or meat (or really, any number of foods, as many recent E. coli and listeria outbreaks have shown), there is a risk when consuming raw dairy. Many raw-milk devotees insist that the risk involved with drinking raw milk is minimal compared with other foods. They may be right, but there is still a risk. 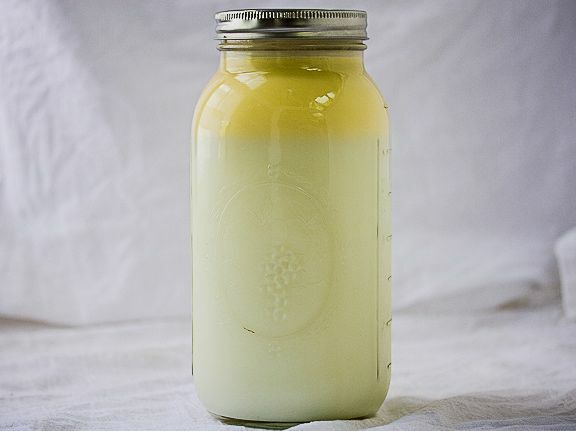 An alternative to raw milk is gently pasteurized milk. Many small-scale dairy operations choose to pasteurize their milk at a lower temperature than large commercial dairies do. This gentle pasteurization preserves much of the excellent flavor that high-quality raw milk should have, but it gives the consumer a safety buffer. I would still strongly encourage you to check out any dairy you buy milk from, even if the milk is pasteurized. Unfortunately, some dairy farmers see pasteurization as a license to slack on sanitation because they know the milk will be heated to kill bacteria before reaching the retail market. Again, ask lots of questions and be informed about the food choices you make. If all else fails and you are unable to find a good source for local, grass-fed dairy, go to your local natural-foods store and buy the highest quality cream you can find. It will not produce the same results as very fresh, grass-fed cream, but it will still yield good results. If you buy unhomogenized milk, simply let it sit, without jostling or moving it, in the fridge for a few days. The cream will rise to the top, at which point you can pour it off into a separate jar for churning into butter. The next step in the process is up to you. I usually employ a Mason jar to give myself a little upper-body workout, but you can use a food processor or electric mixer fitted with a whisk attachment as well. Work with cool but not very cold cream, as cream that has been given a little time at room temperature will be slightly easier to churn into butter. Then, simply shake. The harder you shake, the quicker your cream will become butter, but the process will take between 10 and 20 minutes. As you shake, the consistency of the cream will change. For a time, it will thicken until you have something resembling whipped cream. After that point, however, this emulsion will begin to break down. You'll know when you've reached butter stage because you will see the butter floating on top of what is now buttermilk. If you purchased grass-fed cream, the butter will be noticeably yellow. 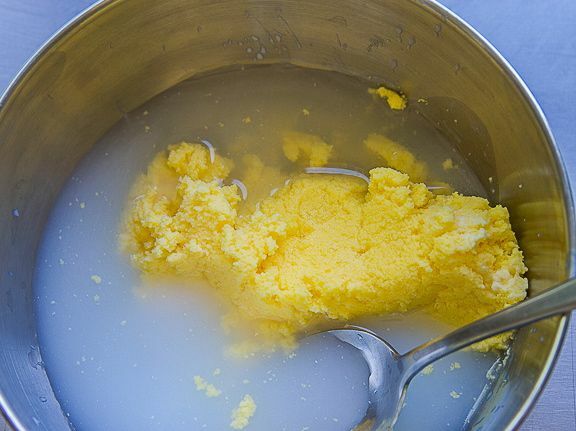 To make cultured butter, simply add a few tablespoons of yogurt or buttermilk with live cultures to the milk and allow it to sit at room temperature for about a day or so, or until it smells faintly sour. Refrigerate for several hours, then proceed with the rest of the process as directed. Strain out the butter and save the buttermilk for another cooking project. This is real buttermilk. There will be little bits of yellow butter floating in it, and it will not be as thick as store-bought cultured buttermilk. Spoon the butter into a bowl. You will inevitably bring a lot of buttermilk with it, so you need to "wash" the butter to increase its shelf life. Any water left in butter will go rancid quickly, so removing this water is crucial if you want your butter to keep. Simply strain out as much buttermilk as possible. Then add about ½ cup cold water to the bowl with the butter in it. Using the back of a spoon, press the butter against the side of the bowl over and over. As you do this, the butter will exude buttermilk, and the water in the bowl will become cloudy. Pour out the water and repeat this process until the water remains clear. You can either add salt here or not. I usually add a small amount of sea salt for the simple reason that it tastes good. At this point, the butter is ready to be used as such. Wrap it tightly in plastic and refrigerate or freeze it, but before you do this, be sure to have a taste — on bread, a cracker, or au naturel. While this may seem silly, I reserve my homemade butter for applications where it will be most appreciated. Breakfast toast and scrambled eggs come to mind. However, there are some dishes where a bit of really good butter will make all the difference. When I was studying abroad in France, I happened to live next door to a bakery with very, very good baguettes. (After patronizing several bakeries in several different towns over the six months I lived there, I can safely say that just because a bakery is French, there is no guarantee that it will make a good baguette.) I was lucky in my proximity to such fabulous loaves, and as they are perfect student food (i.e., cheap and full of carbs), I often availed myself of them. I subsequently developed a love-hate relationship with baguette sandwiches, leaning more toward the "love" side of the equation. You see, baguette sandwiches can be utterly delicious, but they wreak havoc on the roof of your mouth. After a bit of deliberation, I decided the aftereffects were worth the temporary discomfort. So I recommend making a butter-and-ham sandwich at least once. This is a very minimalist construction of bread, butter, and thinly sliced ham, in which the quality of the ingredients truly matters. First, find a sturdy, crusty, artisanal baguette from a local baker. Second, use homemade butter or the best store-bought, European-style salted butter you can find. And third, search out a good, thinly sliced ham. You don't want prosciutto or another very salty ham for this. In fact, you want a fairly mild ham to avoid drowning out the butter. This sandwich is best enjoyed in total, reverent silence. For my second butter-centric dish, consider the radish. I know, I know, we've all seen radishes and butter floating in and out of the blogosphere for the past year, but I must recommend it again. Source some fresh, locally grown radishes (a good indicator of this is whether they still have their tops, and whether the tops look fresh and perky or wilted and surly). Wash them well, then serve them with excellent butter, coarse sea salt, and freshly ground black pepper. This is an excellent addition to a cheese plate, a light appetizer, or the beginning of a simple breakfast or lunch. Finally, and for a slightly swankier dish, try pan-seared scallops in brown butter. Purchase several large, "dry-packed" scallops — this means that the scallops have not been treated with a solution to make them white, as scallops are naturally a very light buff color, and may even look pinkish. Season them with salt. Heat a large, heavy skillet (not nonstick) over medium-high heat until very hot. Add a tablespoon of butter, a tablespoon of canola oil, and a large shallot, thinly sliced. When the oil just barely starts to smoke, add the scallops and leave them for about two minutes. If your scallops are on the smaller side, this step may require only a minute and a half. Take stock of the level of brownness on the underside of the scallops and act accordingly. Flip the scallops and cook for another minute, being careful not to overcook them. Serve the scallops immediately. Butter is a queenly fat. While perhaps a bit fickle and dainty, it can make a substantial difference in many dishes. More importantly, olive oil need not have a monopoly on cooking. 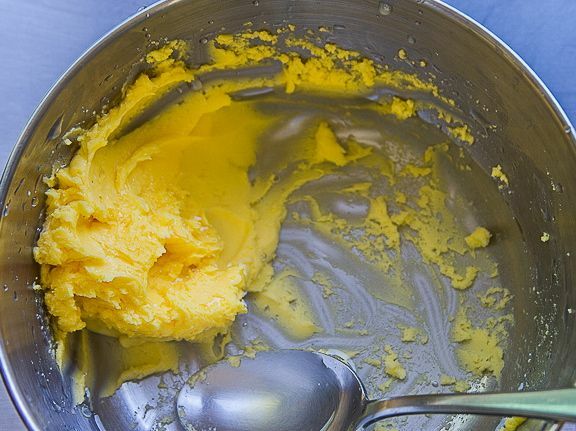 As central as it is to the way we cook, butter is, quite literally, an important piece of the culinary pie.